﻿ e36-tech.com • View topic - X PIPE? Air, fuel, and a spark, thats what makes every one of these Bavarian powerhouses churn at up to 7000RPM. Discuss all 1992-1999 BMW 3 series motors here. Including all M50, S50, M52, S52, M42, and M44 variants. So my question is, Is it worth it? I've never seen it done to a E36, but I hear you get more power out of it rather than a straight pipe (which is what I have right now). Any input would help thanks! nothing that has a bend will ever increase power. You might see the power curve change a bit, but the straighter the exhaust, the more power...99.9% of the time. 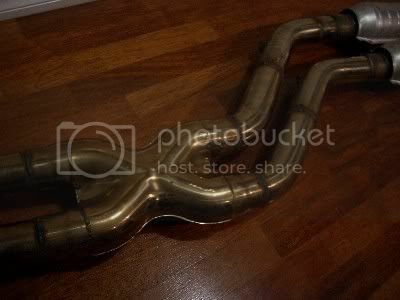 x-pipes help alot when you have headers. or anything that has 2 banks. It helps equal out pressure. ali wrote: nothing that has a bend will ever increase power. You might see the power curve change a bit, but the straighter the exhaust, the more power...99.9% of the time. A mate of mine with an E36 325i got an X Pipe put in his car and it made a pretty big improvement to how the car drove. There was a significant increase in low end pull and the engine seemed a lot more free-reving. Leo_328i wrote: A mate of mine with an E36 325i got an X Pipe put in his car and it made a pretty big improvement to how the car drove. You can't put an x-pipe on a I6.... on a v8, the headers are on opposite sides of the car, and the x-pipe connects them before the go out the back. BMW headers are on the same side of the car and are already connected. Theres nothing to x.
x-pipes are a means of equalizing the pressure on both sides of a V engines exhaust... in a mustang u usually wanna do it as close to the front as physically possible... the only reason that they use x pipes more often than just a straight tube connecting the two pipes (H pipe, if u will) is because the angle at which the flow enters and exits the flow produces less head loss. I think xpipes rae good for big motors like v8s and up.. but on a 6 banger I wouldn't worry about messing with an xpipe, straight pipes ftw. that is an x-pipe. Like Mike said, you don't need it... it isn't going to help you make power.